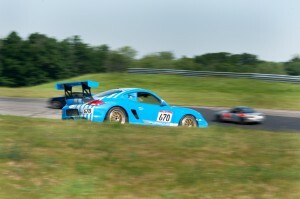 On June 16-19, Rally Sport Region (RSP) held its annual weekend event at Grattan Raceway. The event celebrated the 20th anniversary of the founding of the club whose members are known for their friendliness and love of the race track. Over 100 attendees enjoyed between two and four days of on-track driving, driver-coaching by Ross Bentley, an on-site massage therapist to combat driver soreness and the welcoming and friendly spirit of RSP members. Although my husband and I were very excited about spending the weekend at Grattan, we did not get off to a good start. On Thursday, he experienced various challenges with his race car and had to drive less than anticipated until the problems were sorted out. 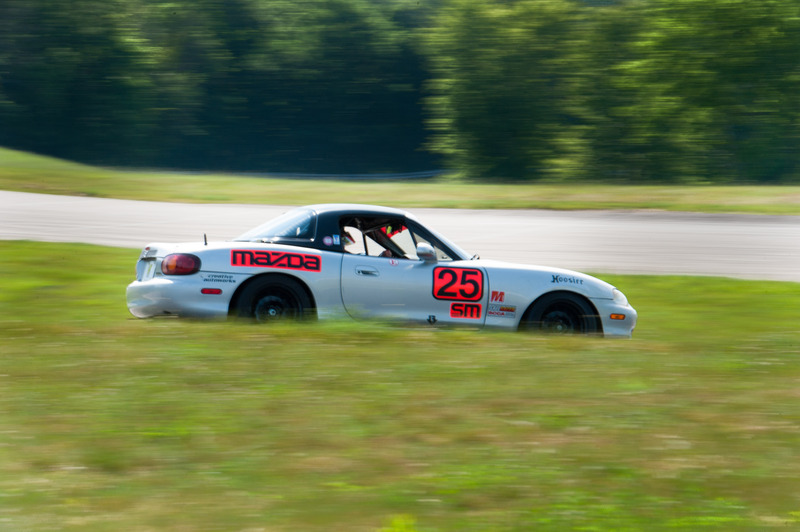 On Friday, my own track car, a Spec Miata affectionately named Smurfette, gave up the ghost at the hairpin three laps into our second. When I first found myself without a track car, I considered leaving the event and heading home to the laundry and closets that needed organizing, but our RSP clan was having none of it. Friends stopped by our trailer to chat and demand that I strap into the Cayman and get out and chase them. Though I was not in the mood to drive (it was hot, I was sad about Smurfette, I didn’t want to risk something happening to the Cayman, etc.) track friends can be quite persuasive, and eventually I got out there and tried to keep up with Frank, Mike, Rich and Wes. And though I wasn’t going particularly fast, things started looking up. I was moved by how many people took the time to offer me their car, encourage me to get out there, and make me laugh. But I was not surprised at all, because this is how this group has treated me since I first showed up at their events in 2008 and people like Rick took me under their wing and made me feel at home. If there is one word to describe the character of the people of RSP, it is kind. When you welcome newcomers into your fold with kindness, they become part of the collective character of the club and contribute to passing that kindness along to others. On Saturday, I witnessed one such interaction between one of our established instructors and a fairly new student, Nichole. The event marked Nichole’s first time driving her car at Grattan, and also her first time in the intermediate run group. During the first session of the day, she spun, recovered and got back on track. On her second session, she spun again, this time in front of fellow student Rizvi. She returned to our trailer feeling a bit down, questioning her skills, and wondering if she should ask to be put back in the beginner run group. Listening to her, I could tell her confidence was shaken. Soon after Nichole’s arrival, Rizvi and his instructor, Roger, appeared. They had come over at Rizvi’s request to check in on Nichole and to debrief the incident. Roger stood by as Rizvi and Nichole traded their perspectives on the spin, paying attention to the students’ interaction. He offered some wisdom to Nichole – perhaps her worries about not being fast enough for the intermediate group were making her overly focused on the cars behind her instead of on the track ahead? Nichole agreed; she was concerned about slowing people down and therefore driving her mirrors. “Maybe I should go back to the green group for a while until I get my confidence back,” she suggested. Rizvi replied that no, she should stay right where she was because not only was she capable, but she was not bothering anyone because they were all there to learn. I was blown away by the conversation between Roger, Rizvi and Nichole. How often do you hear about drivers taking the time to check up on someone’s well-being instead of complaining about having to wait too long to pass? How often do you see an established instructor listen to his students patiently, allowing them to formulate their own insights and solutions rather than stepping in and lecturing about correct procedure or pointing fingers? At RSP, the answer is often. In our group, it is not unusual for instructors to treat students with respect. It is not unusual to hear students telling others, “you drove really well out there!” or “you earned that pass!” When trash talk happens, it is uttered in a jovial and respectful manner so as to add to the positive environment of the event. Criticism is not often necessary, but when it is given, it is shared in a constructive manner so that it will contribute to a driver’s growth instead of diminishing their confidence. And when a group is driven by kindness and relies on encouragement and respect, the results can be quite wonderful. Rizvi and Roger’s kindness worked wonders for Nichole. She stayed in the intermediate run group and went on to drive with confidence the rest of the weekend, gaining speed and braking less. By the end of the weekend, she was smiling broadly and ready for the next opportunity to work on her skills behind the wheel. For me, driving with friends still beat sitting around under the canopy and feeling sorry for myself and my broken car. The more I got out and the more time I spent with this encouraging, funny, talented group of people, the more the weekend improved. I laughed until I was hoarse on Friday night, I got a ride from my husband in Tom’s GT4 and I enjoyed driving our Cayman faster than on my usual commute (but according to a friend’s ribbing still “as slow as on a Sunday drive.”) I ended up staying until the end of the event and I was reminded that I don’t just show up on track to drive, but to enjoy the camaraderie of the RSP community. Those friendships, unlike a blown engine, are truly irreplaceable.